Work, oy. everyone voted no-go for deployment and they still deployed. Such a mess. We’ll be cleaning up production for the next few weeks. I’ve been doing a lot of singing as part of the ATT Cares Band too which is a lot more fun. Owen reaches new levels of adorable every day. Bryan’s step mom was here last week and she got him a balance bike. He loves it. His determined face is so cute. He’s gotten very good very quickly. We’ve also been having a lot of fun at various parks on the weekend. He says new things every day. I love it when I catch him “reading” aloud to himself. He finally says his own name now too. Yesterday morning he asked to go in the car when I brought him outside for our walk. I told him no, we’re going to the park behind our house. He got very upset, went into my purse, grabbed my keys, found my car key and started trying to open my car door. Well, after that I had to take him to the other park :D He doesn’t back down easily that’s for sure. Ahahaha he sure has a strong head on his shoulders! 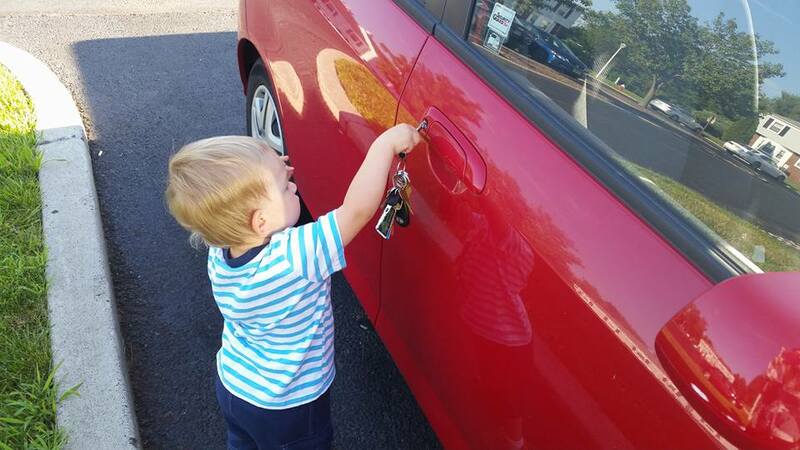 Love that he was trying to open the car doors with they keys. So smart. I am also glad he plays with other kids so often. I really need to get Ezri into something that gets her to interact with other kids more often. It’s not often enough unfortunately.